A comprehensive introduction to statistical methods for data mining and knowledge discovery. Extensive solutions using actual data (with sample R programming code) are provided, illustrating diverse informatic sources in genomics, biomedicine, ecological remote sensing, astronomy, socioeconomics, marketing, advertising and finance, among many others. Walter W. Piegorsch, BIO5 Institute, University of Arizona, Tucson, AZ, USA is the current Editor-in-Chief of the journal Environmetrics and a previous Chairman of the American Statistical Association Section on Statistics and the Environment. 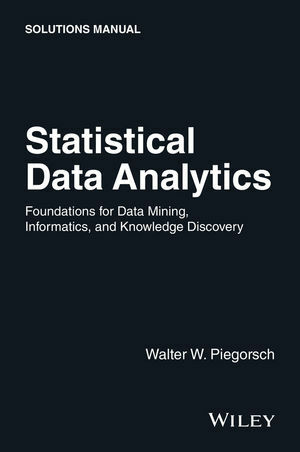 Piegorsch is also an elected member of the International Statistical Institute and a Fellow of the American Statistical Association. He previously served as Joint-Editor of the Journal of the American Statistical Association and on the Board of Scientific Counselors for the U.S. National Toxicology Program.